Thanks for the note on the One second needle. I’ve had my eye on these needles each time I go to joanns to try on my quilts. I’ll stich with the needles with the open tops. I absolutely agree about supporting our local quilt shops! I struggle with this, though, because all of MY local quilt shops cater to a different aesthetic. There are five or six quilt shops within a half hour’s drive of me (I’m in south central Wisconsin) and they carry very few fabrics that appeal to me. They’re wonderful people – this is not a mod vs. trad bashing comment – but I don’t want to buy their fabric. It’s a bit of a Catch-22. I don’t shop there because they don’t carry fabric I like, and they don’t carry fabric I like because I don’t shop there. Lightbulb moment – if we want this to change, we need to talk openly with our quilt shop owners. Brilliant! I’m sure your local shops would be interested in hearing about what you like. If you like it, others probably do too. Thanks for the info in the needles. In the picture they look big, but I might have been tempted to try them. Now I know not to. 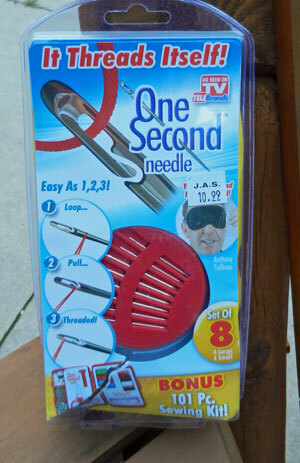 There are some NICE needles called Spiral Eye that work really well. They are a bit pricy but work really well because they don’t come unthreaded and you can use them with kind of short tails. I had a problem with one and contacted the inventor. She was happy to have me return the needle for a replacement as she is very quality oriented. I bought mine at my local quilt shop :>) We are fortunate to have several quilt shops in our general area and they all have their own personality. One owner is a wonderful pattern designer whose latest pattern is generating lots of sales through Keepsake Quilting. We are so excited for her success!